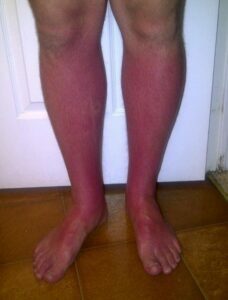 The good looking but totally sun-fried legs pictured here was taken a day after my husband went sailing and didn’t bother using the sunscreen that I gave him. His legs probably looked even worse but he suffered and did nothing for 24 hours until deciding to casually ask me “hey, is this normal”? I’m not one of those people who believe you should slather on chemical sunscreen every time you walk out of the house. You need Vitamin D and the best way to get it, is of course from the most natural source – the sun. That being said, if you are going to be in the sun for more than 20 minutes or it’s a particularly hot day with a high UV index, sunscreen in definitely required. I recommend and use the Badger brand, which you can find at most health food stores. It’s natural, comes in an unscented or lightly scented formula, is water resistant and non-irritating to skin, including the face, even on my youngest children. Unfortunately, sunscreen doesn’t work if you don’t use it, as you can see. So what’s the best way to treat a sunburn if you do get one? Since a sunburn should be treated as any burn would,the first step would be to immerse the burnt part of your body in cold water or a cold bath for 10-15 minutes. (For a soothing effect, you can add colloidal oatmeal, such as Aveeno). After that, one solution is aloe, which is terrific for a sunburn. The problem is, the best way – really the only way, in my opinion – to use aloe is directly from the plant, since the aloe gels and lotions you find at the drugstore usually contain too many chemicals and unnecessary ingredients. Another fantastic remedy is 100% pure aromatherapy lavender oil. Use one or 2 drops every 6 hours, undiluted, over the burnt skin. (2 drops covers a large area). Why lavender? As the story goes,one day in the 1920’s, a French cosmetic chemist named Rene-Maurice Gattefossewas making fragrances in his lab. He burned his arm very badly and thrust it into the nearest cold liquid – which happened to be a tub of lavender oil. He was surprised to find that the pain lessened considerably and that his wound healed very quickly and left no scar. He was so fascinated by this that he spent the rest of his life researching the healing properties of essential oils and actually was the one to coin the term “aromatherapy.” Cool, huh. I thought so. In addition to cold water, aloe and/or lavender, take an anti-oxidant formula to help speed healing, and of course, stay out of the sun for a few days! In case your were wondering, with this regimen it only took 3 days for that sunburn to heal. Don’t forget your sunscreen and have (safe) fun in the sun! DO YOU SUFFER FROM CHRONIC BLOATING? SHOULD YOU AVOID NIGHTSHADE FOODS?